Taking on epic trips to achieve huge goals are worthy ways to spend one’s time. I’m proud of the many projects I’ve taken on and I’m looking forward to what the future holds. There’s lots of things I’m still psyched to try. Oh baby, it’s a wild world! But usually life isn’t so extreme. I’m still enamored to simply ride my bike close to home, enjoy a route I’m more familiar with, and ramble about without any time goals in mind. Meet new people. Sleep out in the sticks and sleep in. Overindulge on some food. The joy of simply wandering around by bike or by foot can’t be understated. It’s good for the soul (or good for mine, at least)! That’s the vision of this new series: Bikepacks Out My Back Door. It’s not about FKTs or records. It’s about exploring places right outside where I live. I’m pretty lucky I live just a few blocks east from where the mountains rise up thousands of feet – there’s so much to explore! My preferred mode of travel is by bike – I adore the speed (or lack of it! ), the intimacy with your immediate surroundings, the excitement of putting a route together, and the little bit of adventure you achieve by going without and testing your mettle (what little I may have). 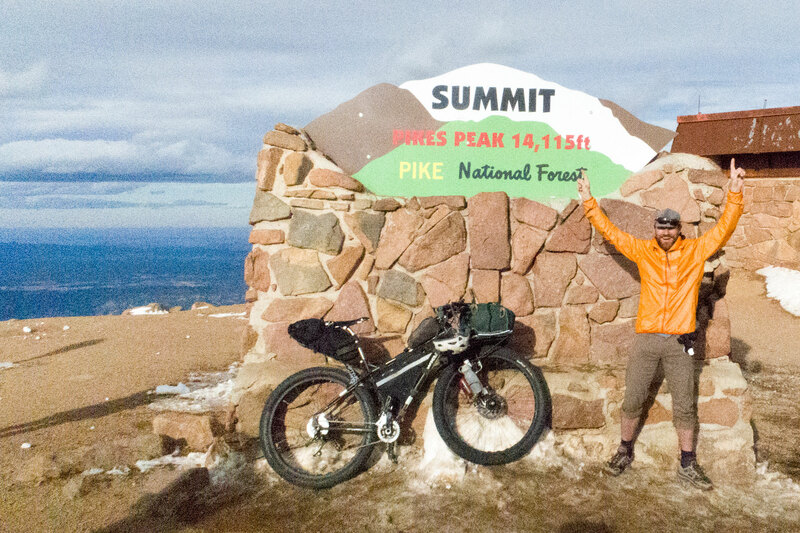 This first installment is about riding up Pikes Peak on my 29+ bike – a Surly Bikes E.C.R.. No matter that it’s not a bike made for climbing – we’re going to summit the highest thing on the horizon: “Pikes Peak or Bust!“. Why not? It’s there… and I’ve never tried going down the other (more difficult) side. This, I can correct! I have no fixed schedule for new installments – they’ll come naturally when I have time, and my curiosity rips me out from my own relatively comfortable life, to get back out there and explore.